Oklahoma Connection | Crowe came with his parents to Oklahoma City, Oklahoma, at the age of five. Admiral William J. Crowe, Jr. was born in Kentucky and came to Oklahoma at age 5, where he graduated from Classen High School in Oklahoma City and attended the University of Oklahoma for one year before graduating from the United States Naval Academy in 1947. 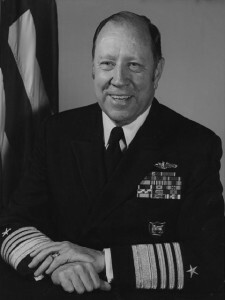 He was assigned as the assistant to the Naval Aide to the President of the United States in 1954, earned his Ph.D. at Princeton in 1965 and was named Rear Admiral in 1974. He held such positions as Administration Assistant and Personal Aide to the Deputy Director of Naval Operations, Director East Asia and Pacific Branch, Politico-Military Division and Senior U.S. Advisor to the Vietnamese Navy Riverine Force. When he became Vice Admiral in 1977 he was Deputy Chief of Naval Operations as well as Senior U.S. Navy Military Representative to the United Nations. Promoted to Admiral in 1980, he assumed responsibility as Commander in Chief of Allied Forces in Southern Europe. Admiral Crowe was appointed Chairman of the Joint Chiefs of Staff in 1985.